This autosomal lineage marker is the modal (most common) gene among Canadian First Peoples, the Quechua of Peru and Western U.S. Native Americans. It is shared between indigenous Americans and Siberians, Chinese and Southeast Asians. It is not often observed in Europeans, Africans or Middle Easterners (though notable exceptions are Berbers and Egyptians). Its highest frequency occurs in the Algonquian tribes of Northern Ontario, where it is found at a level of 37%. Among the Asian “deep ancestry” counterparts of Native Americans, it reaches levels of as much as 20% in Mongolians. Its lowest frequency is in Windhoek in Southwest Africa (0.3%). 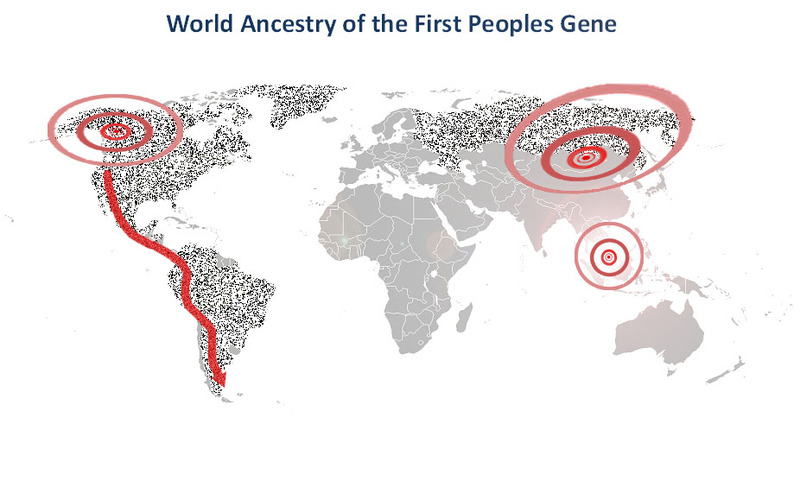 From a deep background in Austronesia, the First Peoples gene spread from epicenters in South Siberia and Alaska throughout the Americas and across Russia.